You are here: Home / Health and Wellness / Digestive Diseases / Do You Take Probiotics When You Travel? Do You Take Probiotics When You Travel? Foreign travel and gastric distress is not a nice combination. I know this from personal experience – my first trip abroad (Italy) was marred by the worst case of “sour stomach” I’ve ever suffered. I blame some grapes I munched on, but it could have been anything. The only silver lining is that I came back from my trip weighing less than when I left – not an easy feat when visiting a country known for its fabulous food finds and perfect pasta dishes. While I’d love to be adventurous like Anthony Bourdain, I can’t get over the memory of experiencing total intestinal betrayal during my first ill-fated trip to Italy. I’ve become a safety-first traveler when it comes to precautions against stomach trouble: using hand sanitizer, eating only cooked foods and eyeing eateries with suspicion. Another item I’ve come to rely on during adventures is a probiotic dietary supplement. Probiotics are helpful microorganisms (mostly gut-friendly bacteria) used to promote digestive health by assisting the body’s naturally occurring gut bacteria. The theory is that taking probiotics helps populate your gut with happy, healthy bacteria to help fight bad bacteria or unfamiliar flora you may encounter during travel. 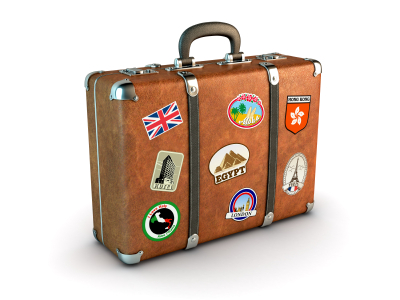 Traveler’s diarrhea occurs when bad bacteria, parasites or viruses enter the gut and upset the natural balance. So, I know taking probiotics won’t protect me from a run-in with norovirus or other bugs that bring about barfing. However, if taking probiotics supports a happy balance in my gut, then I feel it’s worth having a little extra help when traveling overseas. What do you think: Is using probiotics helpful during travel or just one more thing you must remember to pack? Do you have questions about using probiotics during travel or everyday life? your content. Thiss article has truly peaked my interest. I’m going to take a note of your blog and keep checking for new informatioln about once a week.